"Witch me a skin for dancing in!" The Witches is another of Hammer Studio's entries into the world of supernatural thrillers (not to be confused with the 1990 Nicholas Roeg film of the same name). Although this was my first time viewing the film, it had gained a kind of infamous reputation among film buffs because of the on-set troubles it suffered. Star Joan Fontaine (sister of Olivia De Haviland), allegedly, often complained at length about how working with Hammer cheapened her career and how everyone on the production was, essentially, beneath her. Interestingly enough, this proved to be her last major film to date. Regardless, the film remains another classic in the Hammer crown, and deserves at least one good watching by any movie fan. Joan Fontaine portrays Gwen Mayfield, a schoolteacher who is applying to work at a private school in a small English town called Haddaby. Her previous experiences with tribal witchery while teaching at African mission schools left her the victim of a nervous breakdown. She seeks peace, and finds it in the idyllic calm of Haddaby. Soon after arrival, though, she senses that things are not all sweetness and light. The priest who hired her, Alan (Alec McCowen), turns out not to be a real priest, and the townspeople seem unusually obsessed on keeping a certain teenage couple apart. Eventually, Gwen suspects nefarious goingson, but she is unable to put her finger on it. Her friend Stephanie (Kay Walsh) makes humorous suggestions that its all due to ancient witchery, but none of that seems to fit. The story here seems familiar, no doubt. We've seen these kinds of things before, where the calm surface actually hides something terrible. 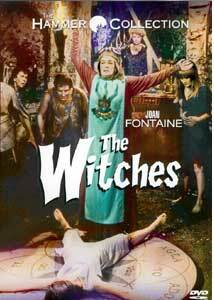 Where The Witches seems to outdo similar films though, is in the subtle treatment of the material. The screenwriting is very clever to only hint at things, rather than whacking you over the head with any specific answers until the very end. Film veterans will undoubtedly predict a few moments here and there, but some stylish twists toy with expectations, creating a very original thriller. The film is based on the popular novel The Devil's Own by Peter Curtis, and the U.S. version of the film was called that as well. The screenplay was penned by Nigel Kneale, writer of the legendary Professor Quatermass stories Hammer produced in the 50's, 60's, and 70's. The writing here is the film's obvious strength as it manages to keep dialogue and character interaction at an extremely tense level. Despite being only 90 minutes long, the film is packed with tremendous depth, happily making it feel much longer. Image Transfer Review: The image transfer here is extremely good, and shows a great deal of mastering care. While the source print obviously has a few defects here and there (spots, hairs, scratches on occasion) the presentation is without fault. Colors are extremely well represented, and the picture is bold and sharp throughout. There are no signs of pixelization or compression artifacts, and even the most shimmer inviting background textures do not. At one point the film does turn extremely washed out, but it only lasts about 20 seconds and was obviously an original negative problem (where the film was improperly changed over after a fade-in). Audio Transfer Review: The audio is Mono (a typical 2.0 Pro-Logic Mono mix) and is very well presented. Dialogue is very clear and crisp, music and sound effects are very rich with wide frequency response. The track also carries some good low-end bass. World of Hammer episode: "Wicked Women"
Extras Review: Along with some trailers, the disc includes another 25 minute episode of the World Of Hammer series (which are scattered onto various Hammer Collection DVDs produced by Anchor Bay). This episode focuses on memorable evil females in Hammer classics. Like the rest of the series, the episode is mainly clips from various films with some narration by Oliver Reed. The presentation is rather nice with stylish keepcase cover art and a wonderful insert that's an extremely good quality reproduction of the original theatrical poster. If The Witches has any solid flaws, they are a few moments, mostly toward the end, when it suddenly lets go of its serious attitude just a little. These moments seem a goofy compared to rest of the film. Otherwise, the movie is a clever thriller about paranoia and has a fantastic supporting cast. It is a bit dated, admittedly, but with superb pacing and clever writing it still holds it's own. Recommended.